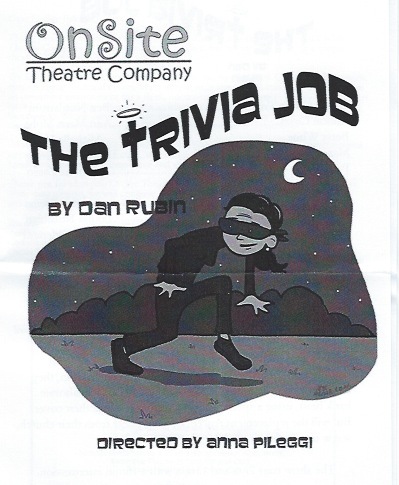 OnSite Theatre Company is always intriguing with their site-specific productions and their latest, “The Trivia Job,” really gets specific with a big plug for the Metropolitan Community Church of Greater St. Louis where we, the audience, play trivia in their community room while a play is going on around us. The play, written by Dan Rubin, has a lot of local and current pop references as well to make us feel even more at home while we have fun. It is, of course, the world premiere as well- written especially for this group and this site. Director Anna Pileggi has woven the story around the three-round trivia night so you really feel like you’re at a regular trivia game but the table with the cast members plot a bank heist between rounds and, during the final round, actually take the half-mile trip to the Anheuser-Busch Credit Union to pull off the robbery. It’s a clever ploy that might actually work in real life since most tables at trivia nights are so self-consumed that they probably really wouldn’t notice a table of folks that actually leave the game and get back “almost” on time which necessitates a little stalling by the one they left behind to cover them. In fact, during the first break, you suddenly look up and realize that the ladies of the middle front table are skulking through the hall carrying bags (which turn out to contain ferrets)- you have to see it and hear the elaborate plan to believe it. In the meantime, the priest who was supposed to act as the MC and question reader got sick so they had to call on a younger priest who gets suspicious as the trivia night goes on. Ben Nordstrom is perfect as the eager young prelate, Father Calvin Truss, who keeps going off on tangents about everything from “The Hitchhiker’s Guide To The Galaxy” to his summer work at Ted Drewes as a boy and his shady story of visiting parishioners before arriving at trivia night with a snootful and the necessity for numerous trips to the “little boy’s room”- thus actually helping the larcenous ladies as they carry out their deed. He’s perfectly nerdy as he regales us with humorous tidbits that don’t always go over well. He then simply pulls out his best Johnny Carson joke-bombing expression and bravely carries on. Donna Weinsting is simply marvelous as the “butch” Maxine who has the plan down to perfection as she keeps insisting nothing can go wrong. She’s the one who gives the passionate plug for the Community Church and keeps us in gales of laughter with her off the cuff remarks as she expertly details how the heist is going to go. Rounding out the cast is Julia Zasso as Patricia, Allison’s daughter who has had a long-time crush on Father Calvin since they went to school together before his “calling.” Her moment to shine is when she must stay at the table to ward off suspicion while the others are actually pulling the heist. They each leave an article of clothing or accessory so Patricia can move around the table donning these items to make the rest of us think that all the ladies are actually still there. It’s really a riot and actually fools no one. The unusually large anonymous donation announced at the end of trivia night seals the deal for Father Calvin’s suspicions but he has already been revealed to having experienced too many “wages of sin” himself that there’s not a lot he can do about it. “The Trivia Job” is a clever script and the questions for the three rounds are not “soft,” you really have to have a good knowledge of things trivial. And, since it is a trivia night, don’t forget to bring snacks along. Beer, wine and bottled water are also available for purchase throughout the evening and even a “50/50” game awarded at the end of the night and, of course, a prize for the winning table. For an evening of fun and laughs, you can’t go wrong with this latest from OnSite Theatre Company. From laundromats to bowling alleys to child care centers and now trivia in a church hall, it’s always an unexpected treat with original scripts written specifically for the site. 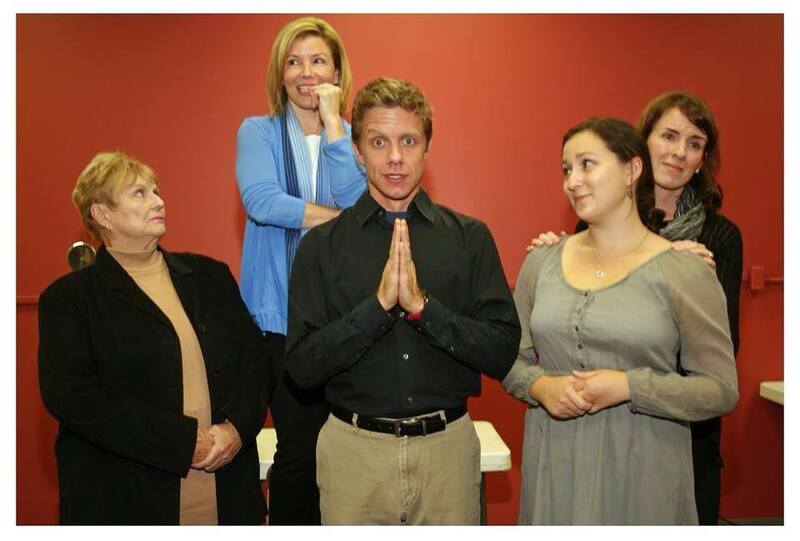 Give them a call at 314-749-8302 or contact them at onsitetheatre.org for tickets or more information. “The Trivia Job” plays through November 9th. This entry was posted on October 26, 2013 at 9:43 pm10 and is filed under Uncategorized. You can follow any responses to this entry through the RSS 2.0 feed. You can leave a response, or trackback from your own site.